Amazing Pistachio Pudding Salad is an old-school quick and easy dessert/salad, which is made with pistachio pudding mix, pineapple, pistachios, marshmallows, and Cool Whip. 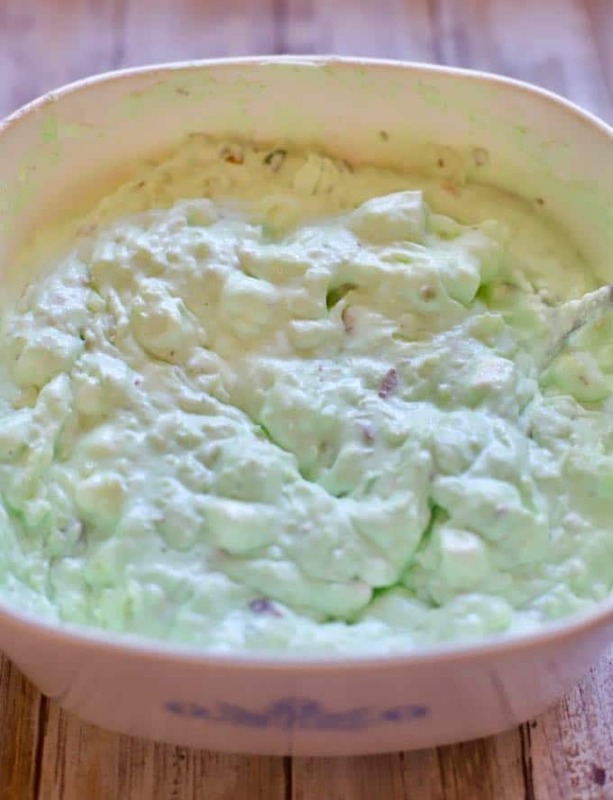 This old-fashioned lime-green wonder first debuted in the 70’s and is also known as Watergate Salad, Pistachio Fruit Salad, Pistachio Pudding Dessert, and Pistachio Fluff Salad. 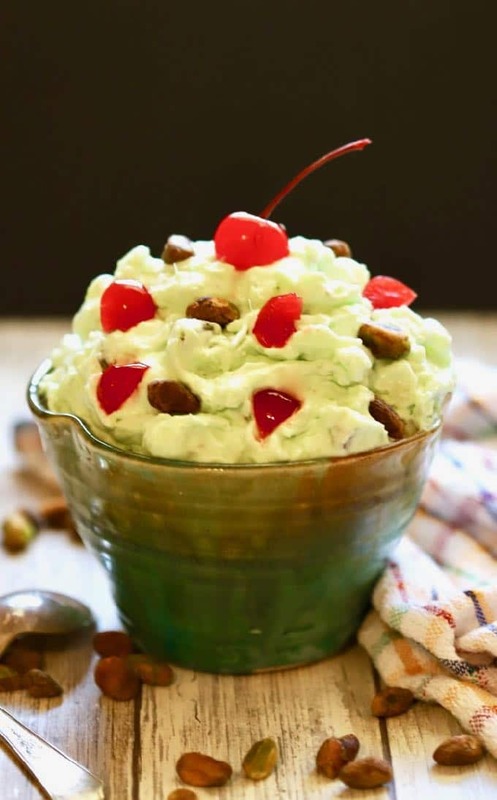 Nevertheless, healthy or not, like the jello salads our mother’s used to make, this Pistachio Pudding Salad or Pistachio Pudding Dessert has stood the test of time! Especially in the South, it is still a popular dish at potlucks and church socials and graces many a table at backyard barbecues. If you like old-school “salad” recipes like this, you might also like: Make Ahead Frozen Fruit Salad and Grape Salad. If you enjoy old-school “dessert” recipes, you might like: Classic Southern Strawberry Shortcake and Minnie Lee Croley’s Sour Cream Pound Cake. 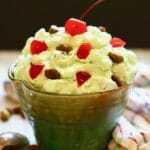 How to make Amazing Pistachio Pudding Salad! The only thing better than the taste of this amazing Pistachio Pudding Salad is how easy it is to make and the short ingredient list. So put on your bellbottoms, play some disco music and let’s get started. 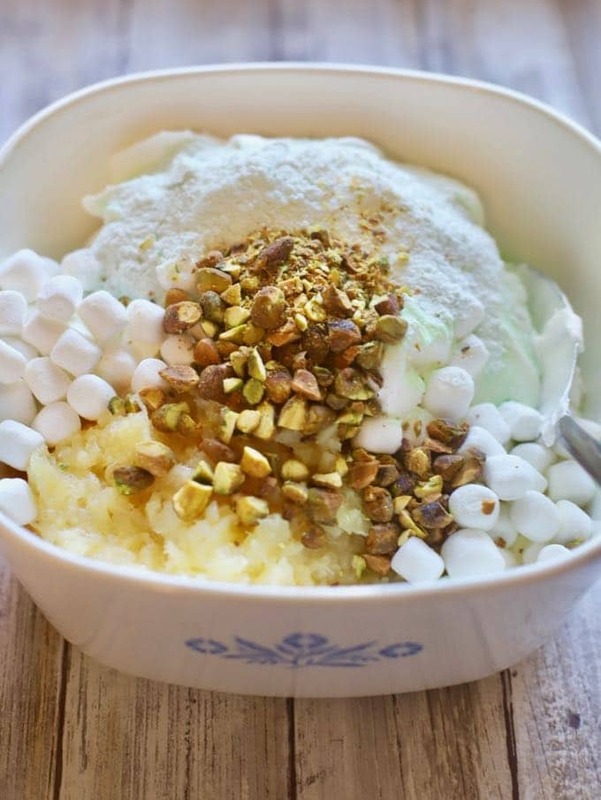 Combine the pineapple, pudding mix, marshmallows and pistachios in a medium-size bowl. Mix well. Add the Cool Whip and stir until everything is combined. 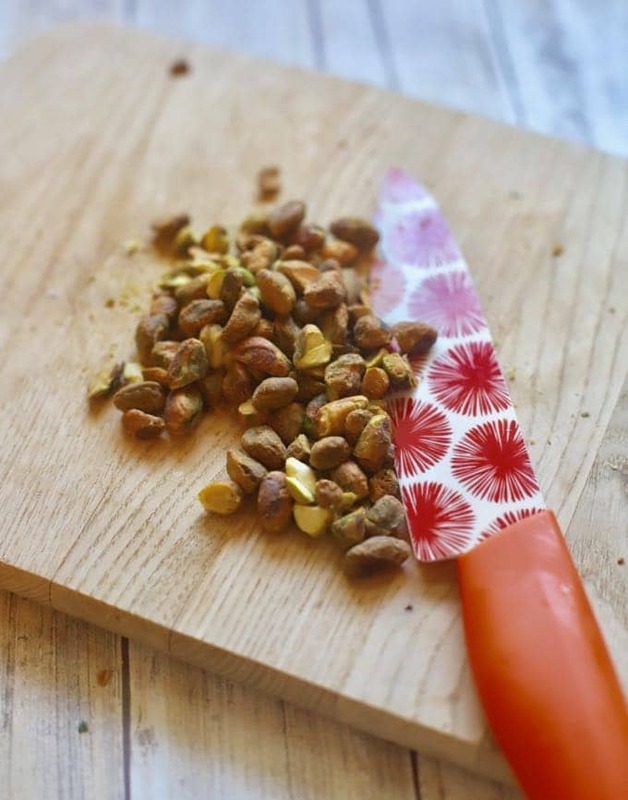 Optional, garnish with maraschino cherries and a few pistachios, if desired, and serve. What’s your favorite old-school “salad/dessert”? Amazing Pistachio Pudding Salad is an old-school quick and easy dessert/salad, which is made with pistachio pudding mix, pineapple, pistachios, marshmallows, and Cool Whip. 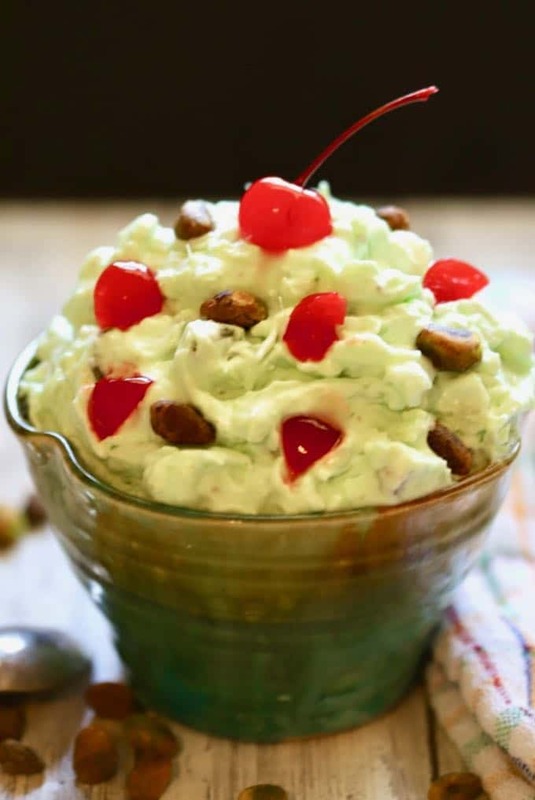 This old-fashioned wonder first debuted in the 70’s and is also known as Watergate Salad, Pistachio Fruit Salad, and Pistachio Pudding Dessert. Add the thawed whipped topping and stir until everything is combined.